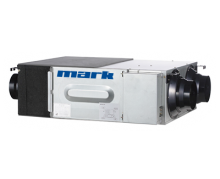 The Mark ERV heat recovery system is the ideal solution for energy efficient ventilation and a comfortable indoor climate. The appliance is equipped with a high efficiency counter flow heat exchanger with an heat recovery efficiency of 75-86%. This means that 75-86% of the energy expelled is supplied to the fresh intake air. This high efficiency means that in many cases no after-heating is required. Possible applications for the ERV include offices, showrooms, apartment complexes and schools.